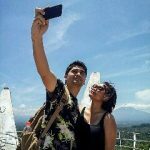 If you have traveled to Magelang, perhaps the most known tourist attractions you know in Magelang are Borobudur temple or Malioboro in Jogjakarta. Yes, indeed both of these destinations are already known to many people. However, Magelang now has many new tourist attractions that are required and very interesting to visit when you are traveling there. Let’s start exploring the tourist attractions in Magelang that you must know. 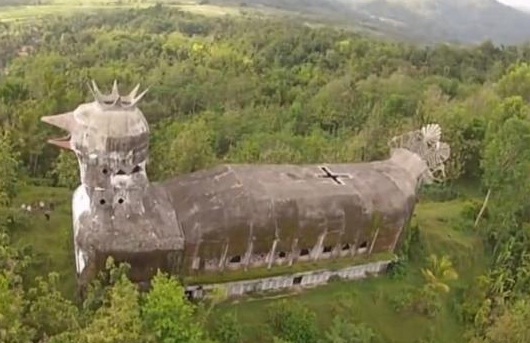 Many people think this is a chicken-shaped building so people refer to this building as the Chicken Church. But if we look more carefully especially when viewed from the tail, this building actually resembles a bird. Yes, certainly, this building is created following the shape of Pigeon with a Crown at its top. Daniel Alamsjah is the founder of Bukit Rhema, the Religious Tour which is currently very famous as the Chicken Church. Now, Daniel Alamsjah is over 70 years old and if you are a lucky traveler, you can meet him around Bukit Rhema monitoring development of this building. Bukit Rhema is not a church so now you know the truth, right? And Bukit Rhema resembles a pigeon and not a church. So you, the travelers from around the world, can visit here. This location is special with beautiful natural scenery; from the crown of Bukit Rhema we can see Borobudur Temple. When in the dawn, Bukit Rhema is also a favorite place to hunt for sunrise. But because Bukit Rhema crown can only accommodate maximum of 15 people, so you need to book the place first. Address: Gombong Village, Kembanglimus, Borobudur, Magelang, Jawa Tengah, Indonesia. Who does not know this most historic tourist attraction in Magelang? Yes, Borobudur Temple. Borobudur temple is a place where millions of Buddhists from all over the world gather to celebrate the feast of Vesak (Waisak). On that day, Borobudur will be full of Buddhists as well as tourists. As you know that Vesak day becomes the main attraction for tourists, because on that day many unique rituals will be run. One of the most awaited events is when thousands of lanterns are flying and decorating the sky with its little light. In addition to being a gathering place for Buddhists from all over the world, Borobudur is also known as the largest Buddhist monument in the world that has high historical value and has been recognized by the world. Here you will be accompanied by thousands of relief panels along the temple wall that will tell you the three levels of Buddha’s life (Kamadhatu, Rupadhatu, and Arupadhatu). Moreover, besides of its historical value, Borobudur temple is also known for the beauty and uniqueness of the building, since this temple is only built from rocks arranged in such way. So no wonder if Borobudur temple is always fully visited with domestic and foreign tourists every day. Address: Borobudur District, Magelang Regency, Central Java. Entrance Ticket Price: IDR 30,000 (adults) or IDR 12,500 (kids). You can visit here anytime because Borobudur temple is opened every day including day off with the operational hours starting at 06.00 am to 05.00 pm. 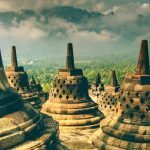 Punthuk Setumbu is an interesting place besides Bukit Rhema to watch the sunrise, from the top of the hill about 400 meters above sea level; here you can enjoy the beautiful Borobudur temple in the morning. Accompanied by the cool air, you can pamper your eyes for a moment to gaze at the sunrise from the enchanting Puthuk Setumbu. In the past, this place was a field owned by the local residents.. But rapidly, after a photographer managed to take a stunning picture of sunrise at Borobudur, people got interested to witness the beautiful sunrise from this place. 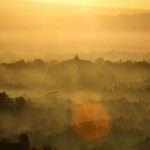 If you do not want to miss the beautiful sunrise from Punthuk Setumbu, it is preferably to be right at top of the hill at 05:00 a.m. While to reach the top of the hill, you have to go through the hiking trails for 15 minutes from the parking lot at the foot of the hill. That means you have to leave at least 20 minutes early before 5 am. Address: Kerahan Hamlet, Karangrejo Village, Borobudur, Magelang. At first glance you certainly can guess why this building is called a camera house; exactly it is very clear because this house is shaped exactly like a DSLR camera, but in a very big size. The owner name of the house is the Mr. Tanggol Angien Jatikusumo, or more familiarly called Mr. Tanggol. 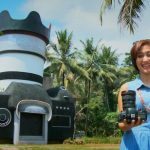 He is a painter from Semarang who has long lived in Bali, then why Mr. Tanggol creates a camera-shaped house? For him, the camera is an object that needs to be treated and loved and he thought to build a camera-shaped house. Because of the uniqueness of Mr. Tanggol’s house which shapes like a camera with its large size, finally this place becomes an attraction and attention of the community. Now, this place is known by many people and many visitors come every day to the camera house just to see the building directly because of their curiosity with its uniqueness. Inside, you will find Mr. Tanggol’s impressive paintings. Or you could say, the camera house is a gallery of Mr. Tanggol’s paintings. After being satisfied to see Mr. Tanggol’s paintings, you can also go to the top of the building or more precisely at the top of building which is camera lens-shaped building. There you can look around the village clearly. Address: Majaksingi Street, Borobudur District, Magelang, Central Java. Entrance Ticket Fee: IDR 5,000/visitor. This tourist attraction in Magelang is one of natural attractions about volcanology especially about Mount Merapi that can be a means of education, research, and recreation that is surely good for you. 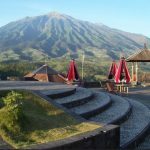 Firstly, there are two types of viewing post in the form of gazebo that you can use as a place to see Merbabu and Merapi mountains, and also the rice fields of residents. Then there is also a volcano theater, or can be called a mini cinema that plays documentary videos of mountain activities of Merapi from year to year and also documentation of some of the most powerful eruption of Mount Merapi which has ever happened. Then there is also a volcano center, here you can learn a lot about the mountain. There is a miniature of Mount Merapi, documents about volcanology, until the example of rocks eruption evidence from year to year. If you want to see Mount Merapi clearly, you can rent binoculars that have been provided. With these binoculars, you can enjoy the beautiful panorama at the foot of Mount Merapi and other mountains. You will be charged an entrance fee of IDR 7,500 per person, while to be able to watch the short movie in the Volcano Theater you have to pay IDR 7,000 per person. Kyai Langgeng Park or better known as the flower garden by Magelang community is the one and only largest park in Magelang. 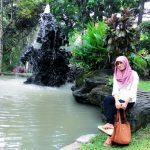 This park with the area of about 27 hectares is one of the most visited tourist attractions in Magelang as a recreational facility to go togheter with family. … Because, there are protected animals and rare plants are living in the park. Obviously, this is an added value, because you can teach children to be more familiar with the environment. Not only that, but also you can enjoy other facilities such as joglo house, water bikes, floating house, playground, Carousel and many more here. Address: Cempaka Street No.6 Magelang, Central Java. Umbul Temple is a natural tourist attraction in the form of hot water bath that was built since the time of Syailendra. The word ‘Umbul’ is taken from the Java language which means to rise; this is due to the water source that always accompanied by the bubbles which arise from the bottom of the pool. This pool is divided into two; the first is a pool containing hot springs with sulfur, while the second pool that is next to the previous pool, is containing ordinary water. In its era, this pool was a bathing pool for the noble children. However, now you can feel the pleasure of enjoying a refreshing hot spring bath. Address: Kartoharjo village, Grabag district, Magelang regency, Central Java. … it is called Curug Silawe because it looks like a lawe (in Javanese) which means spider web. 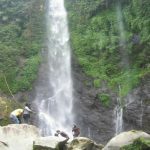 At the bottom of this waterfall there is a small pool that formed due to water blow from Curug Silawe. In the pool you can play the water safely because it is not too deep. To be able to enjoy the beauty of waterfall and water play here you only need to pay entrance ticket for IDR 2,000. Address: Kopeng Kulon hamlet, Sutopati village, Kajoran district, Magelang Regency. 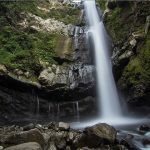 The waterfall is located in Telogorejo Village, Grabagistrict, Magelang Regency, Central Java, or located right on the slope of Mount Telomoyo; a mountain that bounds Magelang regency, Semarang regency and Salatiga city. The beauty of nature is still good and natural, with green plants and trees on the left and right of the entrance along 400 meters from the main road, to the location of the waterfall. Sekar Langit has also been the location of shooting for Yohana Gadis Rimba movie, starring Lidya Kandou – Atex Sudarmo and directed by Wim Umboh (1983). Several years ago, the entrance to the waterfall had damaged caused by landslide disaster, but the local government has been rebuilding the road by hardening it with cement. 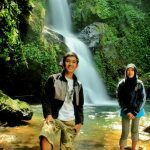 The allure for the visitors who visits the waterfall, in addition to its natural beauty, is the legend of Jakatarub. It is said, in this lake, Jakatarub peeked stole a shawl which belonged to an angel who took a bath in the lake. The name of the angel was Nawangwulan, finally she could not go back to Heaven (Kahyangan) and married with Jakatarub since she lost her power due to her shawl were stolen. The uniqueness of this waterfall attraction is, we can see the waterfall from three different sides. First is from the top of the waterfall, from the side of the waterfall and last from the bottom of the waterfall. Tourists who feel tired and hungry can relax for a moment enjoying the packed meals and the cool atmosphere accompanied by the sound of the waterfall in the rest area. After being satisfied, you can enjoy the beauty of the natural river flow and clear water that can be a fun place to play. Right at the back of this waterfall is a cave that is approximately 2 meters wide and approximately 2.5 meters in height with unknown length, because it is said, this cave has no end. If you are interested to go this cave, you must first enter Grojogan Kedung Kayang Magelang, and then walk up to 1.5 meters behind the waterfall. According to the rumor, this cave is often used for a hermitage location, for those who have special interests. In Kedung Kayang waterfall you can enjoy the beauty of nature and the freshness of the water as a whole when you have paid entrance fee of IDR 4000, the price is very affordable. Did you know, if the springs that were found around the waterfall, one of them, named as Mata Air Penguripan which is commonly used for various needs and purposes. Mount Andong is a shield-type mountain located in Magelang regency, Central Java. This mountain has never had any erupting activity. 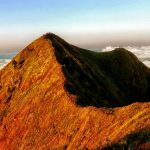 Mount Andong is located between Ngablak and Tlogorjo, Grabag around 1446 m altitude. Mount Andong is one of the few mountains that encircle Magelang. Side by side to Mount Telomoyo, this mountain is located on the border of Salatiga, Semarang and Magelang. One of natural tourist attractions in the slope of Mount Andong and can be visited by tourists is Mangli Forest Tourism. Mangli Forest is an administrative forest managed under the responsibility of RPH Pager Gunung, Section of Unitary Entity of Ambarawa Forest which is one of BKPH in Perum Perhutani of North Kedu Forestry Unit (KPH). Mangli Forest location is not far from the main access Jogja-Semarang road, which is paved through Ngablak District. On the right side of the road there is a clump of clove plants remained from colonial period that still survive. Clamps of Various bamboos also make at right and left of the road with various types, ranging from petung, apus, legi, wulung, to ampel bamboo. Some terraces are used by residents to grow vegetable commodities such as cabbage, carrots, long beans, eggplant, to chili and jetsin plant. Although the original type of this forest is tropical rain forest, but the main vegetation trees in Mangli forest are pine trees. There is Mangli campsite, which lies in the courtyard of valley, right on the sidelines of a pine tree. Campsite area is quite spacious equipped with toilet facilities. If you visit in Magelang to visit various areas such as Borobudur temple, Mendut Temple, KyaiLanggeng Park, Ketep Pass of Merapi do not forget to take the time to rafting at upper Progo river area. Progo rafting or rafting Progo is the right choice for those of you who are passionate about water challenges. Rafting progo or progo rafting will give you much satisfaction because rafting Progo or Progo rafting has low level of dangers. 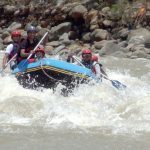 The Progo rafting guide will guide you through the rapids in rafting Progo or Progo rafting. The place of the upper Progo River is located in Magelang Regency with its full address at Griya Tok Songo Housing in Magelang City, Central Java. Upper Progo River is very close to attractions such as Mendut Temple and Borobudur Temple. For the distance, if you are from the city of Jogjakarta it is about 50 minutes. The rapids in Upper progo river are the rapids that have grade III to III +, the upper Progo River has the distance of 12 kilometers, with time to do the rafting tour about 2.5 hours up to 3 hours. For those of you who are beginners or have never done any rafting, Upper Progo River is the right choice because the level of difficulty and danger is very low for rafting or rafting trips with family and office mates.